In order to connect equipment where hygiene is a top priority, NES supply a range of seals and fittings which are compliant with the widely recognised DIN 11851 standard. All our products comply with key criteria, such as uniform wall thickness, tight tolerances and suitable finishes. DIN 11851 is commonly used in fitting for the pharmaceutical, biotechnology, food, chemical and solar industries. Offering high quality fitting, they are robust, easily sterilised and cavity free. Used throughout Europe in many hygienic settings, NES supply DIN 11851 seals which are precision manufactured here in our Sheffield facility. DIN (Deutsches Institut für Normung) standards refer to a series of technical standards originating in Germany. These standards are widely used throughout Europe to ensure norms for quality control, safety, environmental protection and rationalisation. The specification of DIN 11851 is in relation to hygienic unions, providing a standard for connections used in sanitary conditions which comply with safety and food standard regulations. Also known as the ‘dairy thread’ DIN 11851 sanitary fittings consist of a clutch thread with coarse, rounded thread edges making it easier to clean. 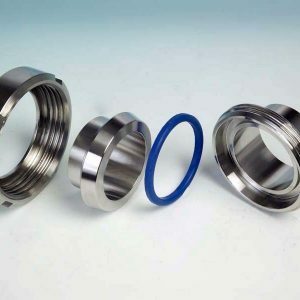 Our DIN 11851 seal products are available in two variations. The flanged or lipped design provides a flush fitting and crevice free joint. The more commonly used unlipped seal creates a secure join which is robust and reliable. Seals are typically manufactured in EPDM, although they can also be manufactured in other elastomers as required. Other common variants include nitrile rubber (NBR), Viton (FKM), and Silicone. All DIN 11851 dimensions are fabricated according to specifications, with the exception of the welding connections. This includes thread dimensions, pipe dimensions and flanges. For more advice on DIN 11851 compatibility, including suitable elastomers for your process, why not contact our Sales Team today.